Finally we have made it to the Whitsundays whooohooo! 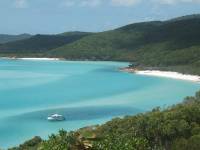 The gateway to the Whitsundays is Airlie Beach were we spent two nights before we boarded our beautiful sailing boat! We went out for a quiet drink on the first night and ended up being 16 again at a foam party- we were convinced by auzzie youths that it was a good idea! we did have a good night, and once we were covered in foam no one could see just how much older we were than everyone else! we spent the next day lazing by the artifical lagoon (cannot swim in the sea this far up because of the stingers-jelly fish that kill you!!) trying desparately to top up our fading tans before the Whitsundays! Finally the whitsundays trip had arrived! we boarded our sailing boat late surprise suprise, so were already well known by the group before we got on the boat! not such a bad thing! The Pride of Airlie was the party boat and the fun started pretty much as soon as we left the marina! We had a really good group of people with us so it made it easy to get to know everyone! We spent the afternoon sailing to South Molle Island were we had something to eat before the drinking began! The first messy night included a beer jug fight between D and the Irish (they started it ;),lots of falling off tables (R and B-not on purpose!) Round insists Bennett pulled her off, im not so sure! ;) lots of free beer from the barman and getting to know each other, some more than others ;)- we didnt get involved! Next day we were bright and early with hangovers in tow-which were soon gone as we started to drink again! whoo! 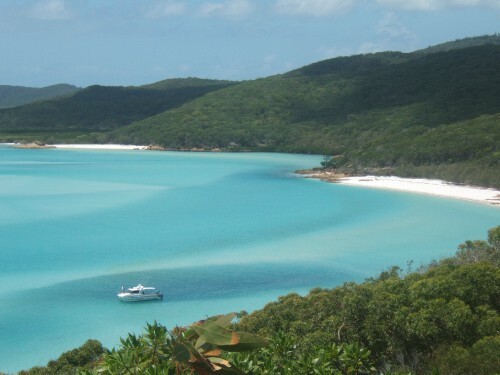 First stop was Whitsunday island where we saw the amazing Whitehaven Beach! we were all completely in awe of our surroundings and couldnt have asked for a more scorching hot day-bliss! D and B decided to do a bit of diving while R lay completely still in the sun! Unfortunately we were disappointed as all we saw was sand :( pants! The second stop of the day was a snorkling spot in the heart of the whitsundays, having made our disappointment very clear to the diving instructor she offered to take the two of us out again whooop! This time we got to see lots of beautiful reef and lots of amazing fish! we were now very happy Kates! R actually got off her lazy bum and had a go at the snorkling as well-she also got to see lots of the reef and fish! and also had a go at the ship jumping with the boys! The next day we were deperately hungover so decided to start drinking at an early 9.30 to stop the pain! it worked really well and we were back to being happy again by 10! ;) we went on yet another snorkling stop where we met our first Turtle ahhhhhhh it was so cute! they are actually really pretty reptiles! Cant really describe how much fun we had on this trip-def the best bit of oz for all of us by far! The pics we manged to get are good but really dont do it justice! you will just have to come and see it for yourselves!